This habit is slowly squeezing the life out of your business. The worst part is you might not even know that you are doing it. It tends to squelch innovation and creativity, gives rise to poor performance and leads to little or no growth. It discourages the development of your staff and teaches them to become unnecessarily risk averse, you basically end up with a bunch of fraidy cats! If you micro-manage often enough or long enough, you will kill your business. If you find yourself (like many conventional business leaders) telling yourself, “I gotta take care of this issue, this problem, or this person. I gotta do this and I gotta do that,” you are probably micromanaging your staff. This isn’t your job as a leader. When you micromanage, you are asking for problems! No one likes a boss who constantly keeps a tight rein on everything; it eventually drives away the best employees. 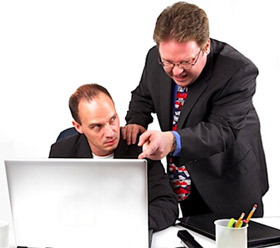 The impact of micromanaging is harmful right up and down the line, not just to individuals but to the corporate culture. However, many tough-minded old-style leaders sneer at this notion because they believe that it is their job as leaders to direct and control their workforce. In fact, most micromanagers don’t think of themselves as micromanagers. Rather, they usually believe they are practicing good management. They assume that a successful leader must be seen to be firm and uncompromising, and must keep a tight rein on everything. The best leaders on the other hand know that absolute control is an anti-conscious state of existence. They realize that their role as leaders is more about influencing an outcome than controlling a process or a person. They know soccer managers should never get on the pitch to score goals; that’s the players’ job! How can you move past micromanagement? Your job is to hire the right people for the job, who are competent and skilful —and then to allow them to do what they are good at without your interference. It’s important to give your people room to think for themselves. You must let go of wanting everything done your way. If you always control the what, how and when of every task, you will end up with lackluster, unhappy and bitter employees. The next step is holding your team accountable. Rather than micromanaging everything, give them targets that are realistic, attainable, relevant and time-sensitive. Perfectly balancing empowerment and accountability is not easy, but business leaders who set the right tone will enjoy greater employee creativity, originality and innovation. Next articleThe ratings game for customers is all about the ‘senses’!